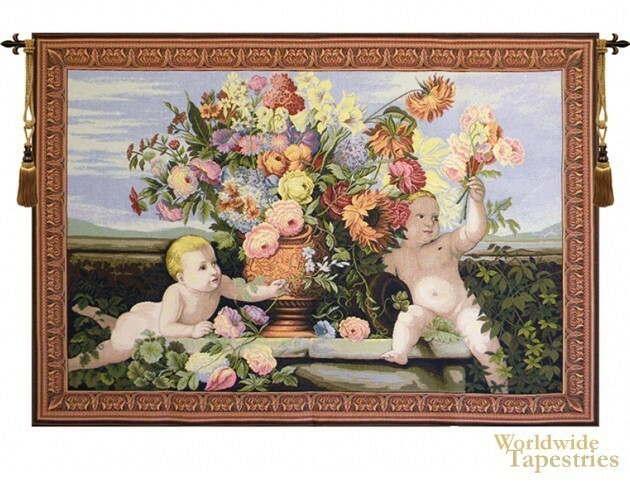 Angels and Flowers tapestry shows baby like cherubs playing with blooms or flowers in a work based on the artwork from Renaissance Italy. Here we see the use of landscape fantasy background on a foreground of a stone platform with a copper urn and an abundance of blooms of flowers. This art tapestry is backed with a lining and a tunnel for easy hanging. Note: tapestry rods and tassels, where pictured, are not included in the price.